1. "The album is titled 'Acoustic' and this doesn't prevent its tracks from employing anything but acoustic techniques." 2. 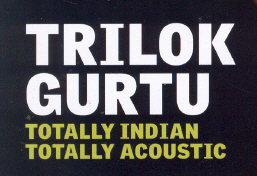 "I do take issue with the definition of acoustic - Empty at the End is clearly an amped up performance." Last night's concert at QEH in the South Bank Rhythm Sticks series, with the Misra brothers and flute, sarangi and sarod in support, was a travesty of its claim which had led to our covering the event in good faith. That would have been difficult in any case, because there was no programme nor even any announcement from the platform at the start! The sound engineer told us that he had not expected to be required for this event, but he was instructed to amplify the proceedings - and to transmit them loudly! During the early items one of the singers repeatedly gestured to him to increase the volume, which was of course far louder than the performers on stage would have been aware. The actual quality of the amplification was better than in some previous Asian music events, but the sheer volume inevitably distorted the character of the instruments and voices. Ambience and sharing with ethnically mixed enthusiasts are potent pleasures in the enjoyment and appreciation of Asian music making. But, paradoxically now, we are increasingly being driven to listen in our own homes to good recordings, made by those same engineers, but retaining control of listening levels to ourselves. The Kufa Gallery is about to close; is there anywhere in London to hear live Indian Music properly?